MAUREEN: From boneless to bone in. Our boneless beef chuck short ribs has been a hit since its launch. It's slow cooked for 48 hours and turns out extremely tender and juicy. Lately, there appears to be problems with the quality of the meat and the marbling if the meat is not very even. It never occurred to me until Leeanne refused to eat it. She told me that the meat had no taste. Since all meat in Hong Kong is imported some where, I decided to look into the beef short ribs with the bone in. It appears that the marbling and quality of the meat is more even and so I've decided to change the cut of the meat from our boneless chuck ribs to a bone-in beef short ribs. 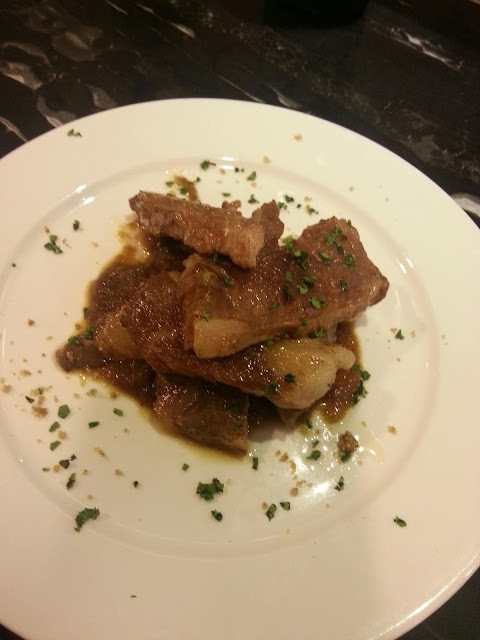 It may upset some customers as the media as been reporting our chuck short ribs as boneless, but then, I would rather upset a few customers than to serve food that is not good enough for the restaurant.